Messier 65 is a spiral galaxy in the constellation Leo. M65 is about 100,000 light years in diameter and is home to about 200 billion stars. The bright core area contains mostly older stars and it is thought that star formation is mostly over with the exception of some smaller regions in the arms. Recent studies suggest that the variance in age of the stars from the core to the outer arms is not that great. There is a large dust lane in the outer arm and it contains a few areas where star formation is likely. M65 is thought to have had some gravitational interaction with nearby galaxies M66 and NGC3628. This interaction has slightly warped the spiral arms of the galaxy. 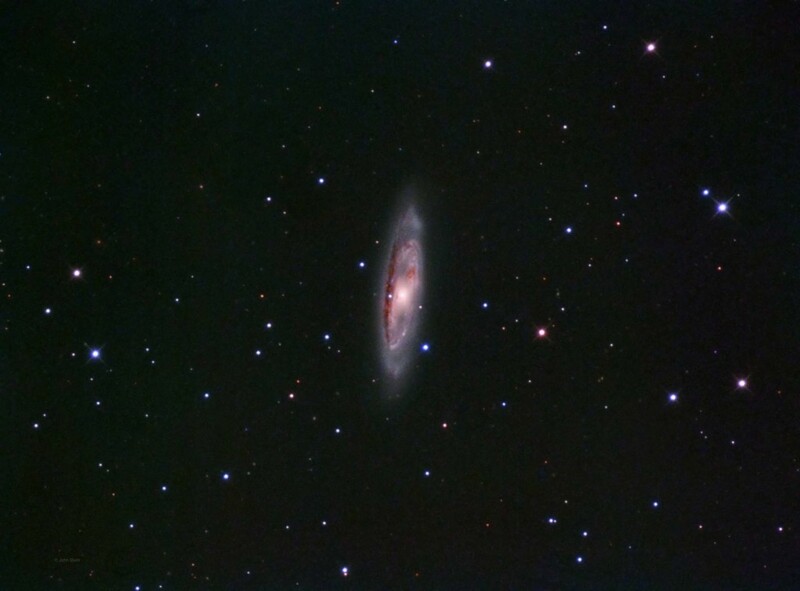 Messier 65, Messier 66, and NGC 3628 form what is commonly known as the Leo Trio. The three galaxies are often photographed together using a wide field telescope. All three galaxies have had prior interactions but it is thought that Messier 66 and NGC 3628 were the most recent. This image was captured from my house in a Bortle 6 region. The humidity was between 70-80% with little wind. The luminance frame was captured in one night and the RGB was captured on another night. Typical for this time of year is the returning marine layer which flows in before midnight on most nights.